Gordon’s Tree and Crane Service offers 24 Hour Emergency Services. We have 17 years of experience in handling all types of scenarios that you might encounter during a Hurricane or a heavy thunderstorm. We have the knowledge and capability to handle all types of tree removal. Hurricanes are unfortunately our largest threat living in Southeast Louisiana. Not only do they create extremely strong winds but they also have the potential of spin off tornadoes. 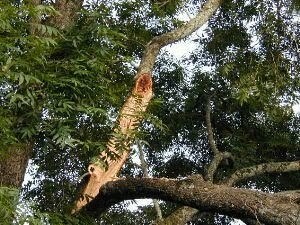 These types of dangerous weather conditions have the ability to wreak havoc on our trees and property. If you have a tree fallen onto your home or car we can use our expect crane operator to lift the tree off your home without causing major additional damage. If you need a tree removed that is uprooting due to strong winds, just give Gordon’s Tree and Crane Service a call and we will be right out. So please don’t hesitate to call on us whether you have an emergency now if it you are just looking to do preventative maintenance before a storm strikes.